Babak explains the meaning of his art to a potential buyer during the Downtown L.A. Art Walk on Dec 13, 2012 in downtown, Los Angeles. On a chilly night in downtown Los Angeles, with a little more commotion than usual, patrons could browse the local stores, restaurants and galleries displaying art from all over the world. Art Walk has been a monthly staple of Los Angeles for many years, and on Thursday, with nearly 50 different galleries, there was enough to see to satisfy anyone’s inner art lover. On display were not only traditional paintings, but creations in all types of mediums, including digital art manipulated by a printer, various illustrations and a sculpture of what Taylor Swift would look like if she were a zombie. One of the most unique pieces was a row of inflated balloons that hung on the ceiling of the GRspace gallery. The balloons changed shape, going from flat to crescent, while also changing colors. The work is called “Rafale” by AK Airways. Rachel Kassenbrock stated that she liked having something to interact with, and touched on just how special “Rafale” was to her. “It’s not exactly what you see every Art Walk, so it’s nice,” she said. The Hive gallery was another sight to see, with an eclectic array of art pieces and photographs, also utilizing various techniques. Among the artists was Preston C., creator of “Twisted Teddys.” His art features teddy bears portrayed in edgy situations, including a crucifixion. Art Walk is not only a place where enthusiasts can enjoy looking at artwork without having to pay a hefty museum cover charge, but it is also a place where budding artists can showcase and sell art of their own. They have been selling their artwork at conventions such as Comicon and Comikaze. Thursday was the couple’s first time selling at Art Walk. “We’re still testing out what kind of shows we do well at,” Ying said. Fabian Pablo, a local Los Angeles artist, hopes to have his work displayed at Art Walk in the future. In the meantime, he spent his time at Art Walk admiring the work of others. 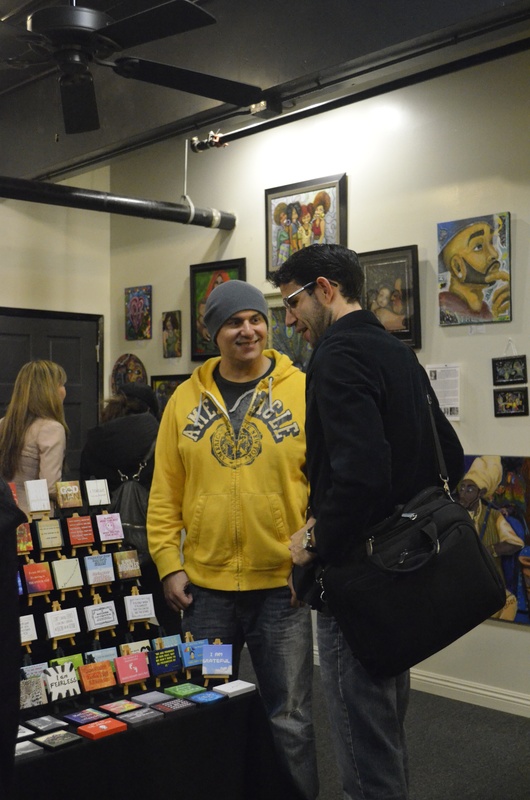 The next installment of Art Walk is Jan. 10. Bring a sweater, a good friend and an open mind. The Santa Monica College Foundation received a donation of over $800,000 from the Estate of Peggy Bergmann for student scholarships at the Board of Trustees meeting last night. This amount is the fourth largest that the Foundation has received. Arrangements were made by Santa Monica attorneys Sonya and Bruce Sultan, according to a press release from SMC. “We’re hoping there will be new legislation to more fully fund education but right now, we think private sources are also important to augment whatever money comes from public sources,” said Sonya Sultan. The Sultans, who have lived in Santa Monica for over 20 years, are active members in the community. They know many of the board members well and were happy to suggest the SMC Foundation when Ms. Bergmann expressed a desire to give to local organizations. This board meeting was the first since the reinstatement of the 2013 winter session. Vice President of Academic Affairs Jeff Shimizu provided details concerning the courses that will be offered. There will be 250 courses offered this winter, down from 350 in 2012 and 800 in 2009. There will not be any arts, physical education or non-credit courses offered. All courses will be on the main campus and the satellite campuses will be closed. Fifteen of the courses are on hold for high-demand classes and are not currently open for registration. In addition, the UCLA Extension program will continue to rent space at SMC and will offer 12-15 classes in the winter. The funding from Proposition 30 will not be received until the end of the fiscal year. According to Dr. Tsang, there is a “cash flow issue” that will be addressed in the near future. Trustee Rob Radar pointed out that the college is still expected to run a loss and will have to use reserve funds as a result of the winter session. Concerns were raised by Emeritus college students during the public comments section of the board meeting. When winter session was reinstated, Emeritus’ classes were not restored. Although some students were upset, others were supportive of the decisions of the board. According to Erica LeBlanc, dean of academic affairs, only 25 days of instruction will be lost. Field trips, lectures and other special events will also be planned for the Emeritus students over the break. This was the last board meeting of the semester and the first with newly appointed board members. The next meeting will be held on January 15, 2013. Adam West. Michael Keaton. Val Kilmer. George Clooney. Christian Bale. These actors have been in their fair share of movies and TV shows over the past few decades. But they all have one deep, dark secret. On the Event Deck of L.A. Live in downtown Los Angeles, a red carpet welcomes you to the “Dark Knight Legend” exhibit, consisting of three sections that display Batman-related memorabilia. Music from the latest trilogy of Batman films sets the mood for the first section of the exhibit, which features artwork created by fans of the entire Batman series. The most notable attraction is a statue built with a familiar childhood staple. “The thing that I noticed right away was the Catwoman made out of Legos,” says Gordon Holmes, who has been a fan of the Batman since 1966. Two versions of the Batsuit, Bane’s intimidating mask and the Joker’s purple outfit are all accounted for in the second portion of the exhibit. These costumes and others on display were worn by the actors during filming, making them truly authentic. Adding to the authenticity is the Batmobile showroom, the final and most awe-inspiring part of the exhibit. Cars from every stage of the Caped Crusader’s history are present, including the original 1950s version, which will be auctioned off in January. An eye-opening video about the evolution of the Batmobile helps viewers understand the origins of their favorite vehicles. Holmes’ favorite Batmobile is the original from the Adam West television series. “It’s sleek; it’s sharp; it still has the spirit of 50s automobiles,” Holmes said. Christina Antuna prefers the most recent installment of Bruce Wayne’s alternate mode of transportation, the Tumbler. “It has the most practical design for what it’s trying to accomplish,” Antuna says. Walking through this “Batmuseum” certainly induces feelings of childhood nostalgia, reminding us of the very first time we read a comic, watched a cartoon or experienced an IMAX movie about Batman. It may even help us remember the idea behind the mask. “It’s good over evil,” Holmes says. Antuna looks at Batman in more human terms. 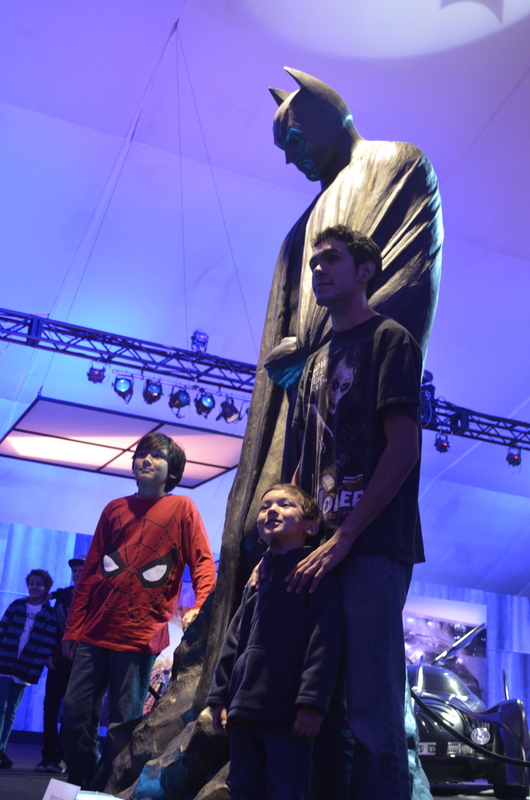 The Dark Knight Legend Exhibit is open to the public from noon to 9 p.m. through Dec. 14, and is free of charge.